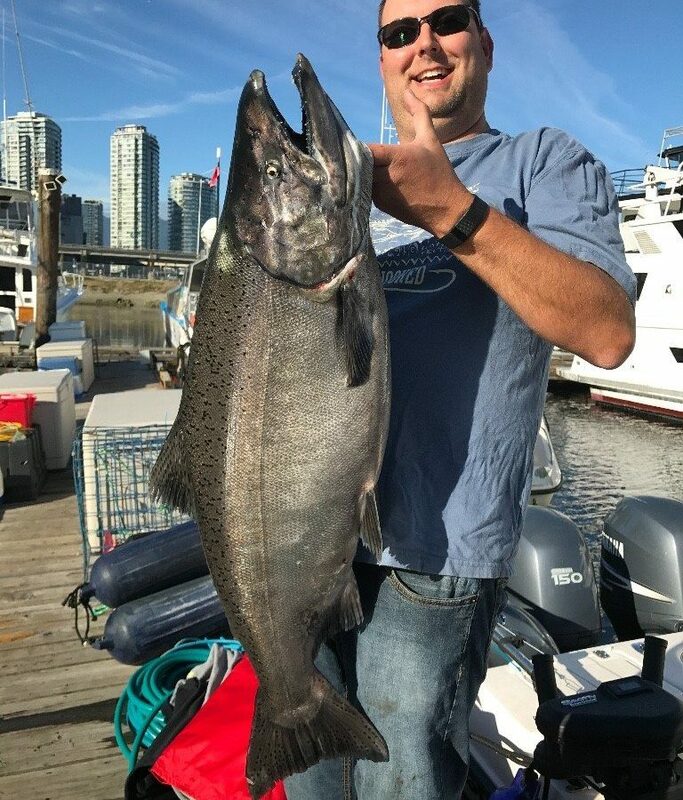 Brett holding up his Tyee from a trip with Jason at South Arm this week. This fish tipped the scales at 30.73 pounds and almost emptied the reel on the first run! Way to go Brett! This past week we did see the fishing for the red chinook slow down, as usual this time of year, and of course the addition of some white chinook in the local waters. We also had a few more coho show up. We have been concentrating our efforts in two main areas. 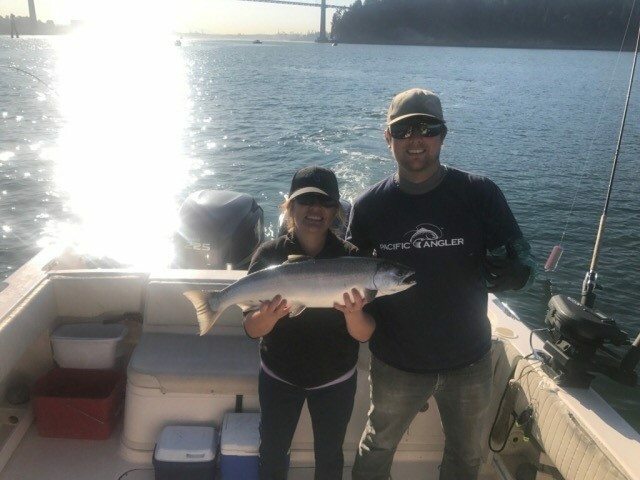 On our shorter trips we have been fishing the Cap Mouth on the flood tide and have had some good success for the first of the Cap chinook showing up and we have also been getting some coho. It hasn’t been red hot, but is has been consistent and our guides have been coming back with chinook and coho on most of our 5 to 6 hour trips to this area. On the ebb tide we have been fishing towards the Pink Apartment, Point Atkinson, or the Bell Buoy. 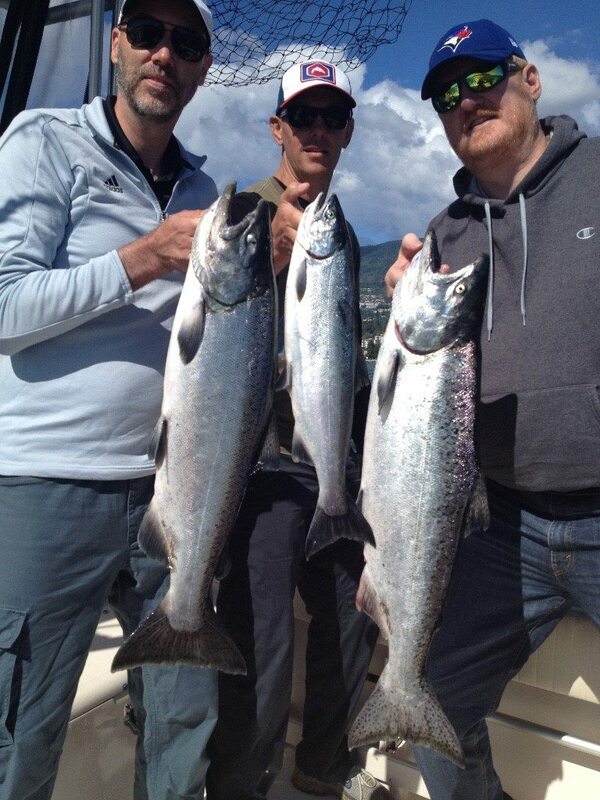 Eddie’s guests with some nice fish from the Cap Mouth earlier this week. On our longer trips we have been going down to the South Arm when winds allow. We have had good success in this area for chinook, coho, and a few chum as well. The big draw to this area in mid September are the large white chinook. This is your best chance at catching a Tyee in our local waters (a chinook over 30 pounds). Jason was with some clients at the South Arm this week and they did just that. Hot depths have been 35 to 75 and on the sunny days the deeper rods seem to be hot. Tom’s guest with a nice coho from the Cap Mouth this morning. The name of the game for tackle this time of year is bait. If you have been reading the reports you know we are running bait on all our rods. We are running about a 50/50 mix of herring and anchovies. Hopefully the winds allow us to head south a few more times this coming week and if so we fully anticipate some big chinook being caught. It is likely we will see a decent push at the Cap this week as well, so brine up your bait and get out there!